Still be annoyed by your nowhere placed coffee filter paper? There is a perfect solution. Why not display your commonly used coffee filter papers on this stylish pastic holder? This coffee filter paper holder making it perfect for displaying paper filters. And with standing design, it is easy to put and take the paper filters. Besides, it is ideal for various settings, such as home, office, coffee shop, hotel and so on. The package you receive includes only a pastic holder without any paper filters. 1-2 cm measurement error is a reasonable range, due to the manual measurement methods. Meanwhile, please be reminded that due to lighting effects, monitor's brightness / contrast settings etc, there may be a little difference in the color of the pictures and the actual item. Made of high quality acrylic plastic, which is durable and resuable. Specification: 4.92"L x2.56"W x 6.89"H/12.5x6.5x17.5cm. It can hold about 100pcs 1-2 and 2-4 cup size, cone-shape and fan-shape paper filers. Paper filters are not included in the package. Comes with a cover, which makes the filter paper holder dust-proof and keeps the paper filters clean. 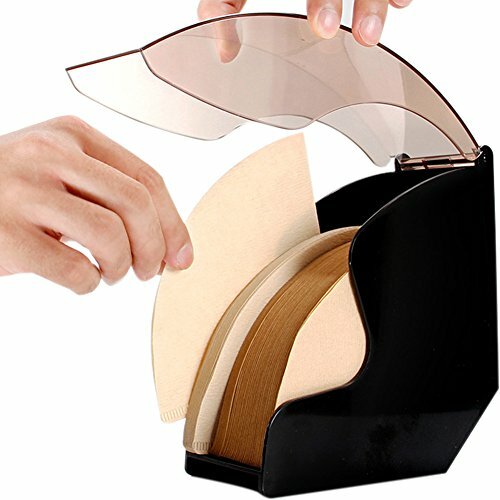 Standing design, easy to put and take the paper filters. Ideal for home, office, coffee shop, hotel and so on. If you have any questions about this product by WINGOFFLY, contact us by completing and submitting the form below. If you are looking for a specif part number, please include it with your message.